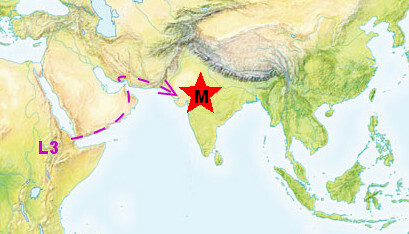 This entry was originally published on June 2013. I judge it important enough to have its own page directly accessible from the blog's header. Please discuss on the original entry. 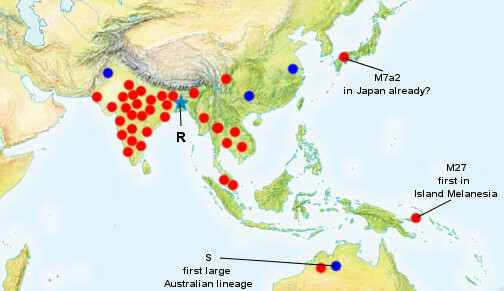 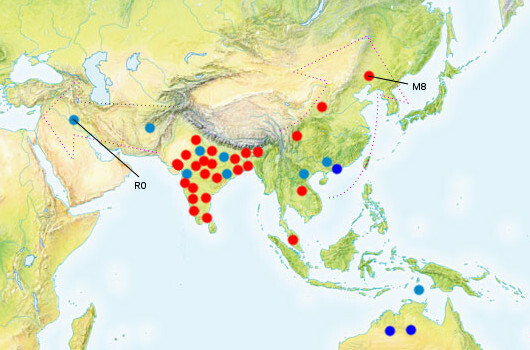 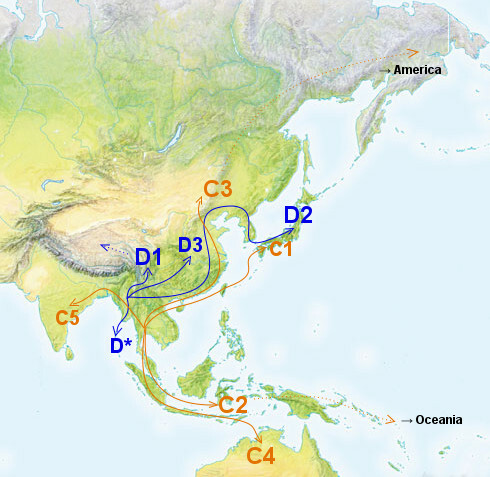 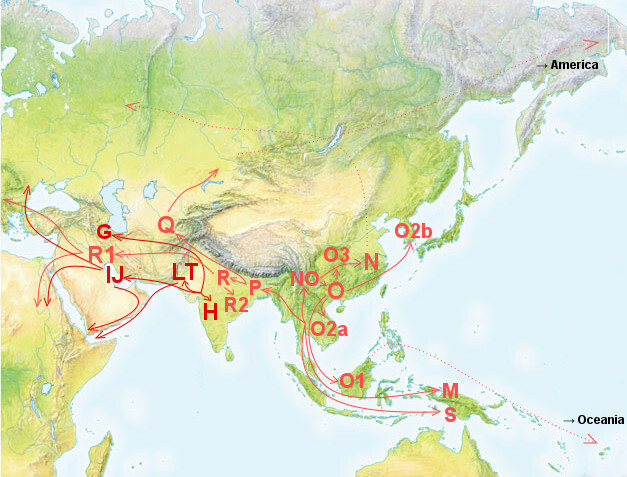 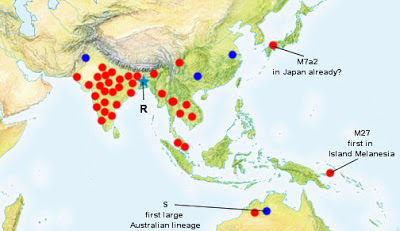 Continuing with the joint series in Spanish language with David Sánchez at his blog Noticias de Prehistoria, I have just written an article on the early expansion of Homo sapiens in Asia and Australasia after the "out of Africa" migration. 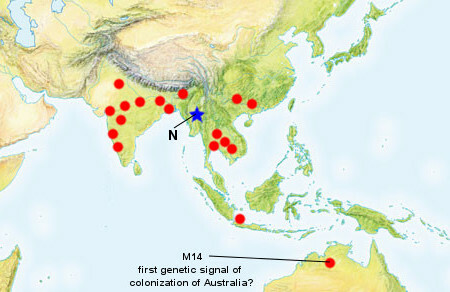 As usual the review is built upon geographic reconstructions and an overly simple "molecular clock", in the case of mtDNA only (which is the base of the interpretation), that merely counts coding region mutations from the most recent common ancestor (the L3 node), using the latest version of PhyloTree (build 15). The presence of M29'Q in Papua must be taken with some caution, as always that a single lineage is involved, what has low statistical significance. 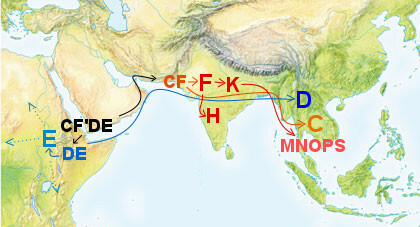 Map 3 represents the molecular time L3+5, which corresponds to the coalescence of haplogroup N, as well as many M sublineages. 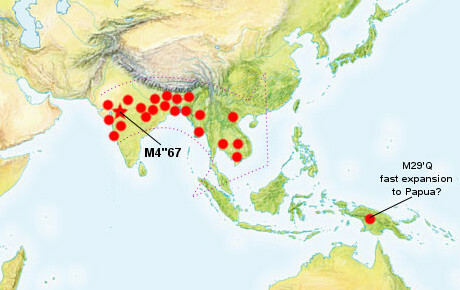 There is a slowing down in the number of nodes sprouting at this "time", so I would estimate it to correspond with Toba supervolcano (c. 74 Ka BP). I stopped here because I did not want to stretch too much the potential of my simplified molecular clock method, surely more likely to err as we move away from the reference point (L3 node) but the tendencies outlined in map 5 clearly continue and even increase at later "moments".